51 percent of cell owners used their phone to get information they needed right away. 42 percent used their phone for entertainment when they were bored, and 40 percent were in an emergency situation in which having their phone with them really helped. 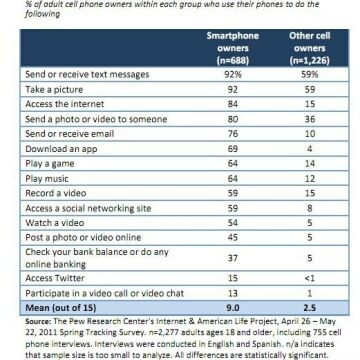 And for those of us addicted to our smartphones, its absence (like my recent terrifying one) is even more profound when you consider some of the findings of this survey: 27 percent "experienced a situation in which they had trouble doing something because they did not have their phone at hand." 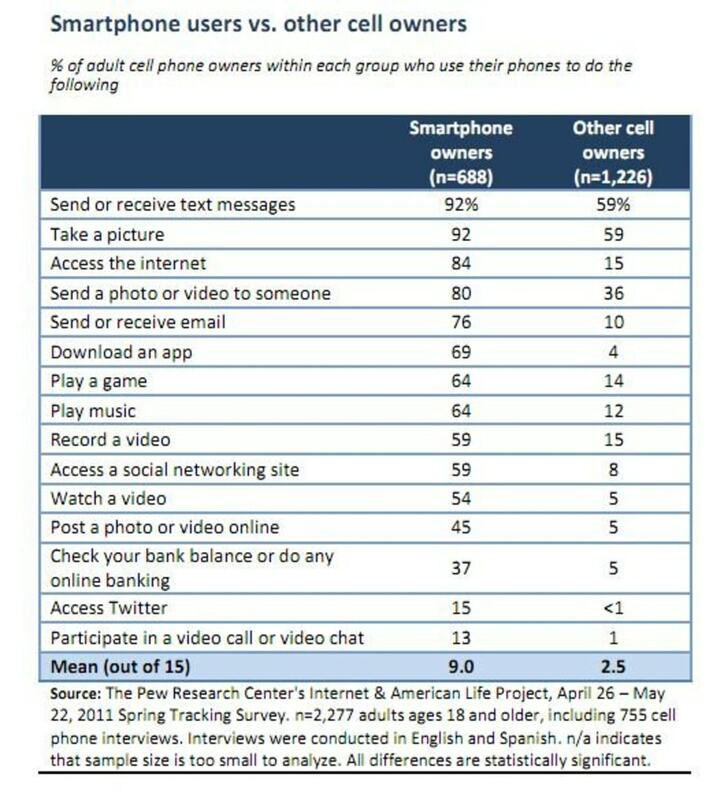 One-third (35 percent) own a smartphone, with nine in ten of that subset using them to text or take pictures with their phones. Eight in ten use their phone to go online or to send photos or videos. In a head-to-head comparison between smartphone and non-smartphone users, activities like accessing Twitter and chatting via video were the nearly exclusive territory of the former. 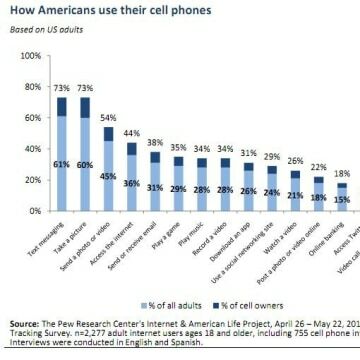 Consistent with previous Pew Internet surveys of mobile usage, texting and picture-taking still appear to be the most common uses for the devices, with 73 percent of mobile owners engage in each of these. But there is such a thing as backlash, and the survey found 29 percent temporarily shut off their phones to take a break. One in five (20 percent) experienced frustration because their phone was taking too long to download something. 16 percent had difficulty reading something on their phone because the screen was too small. one in ten (10 percent) had difficulty entering a lot of text on their phone at some point in the preceding 30 days. 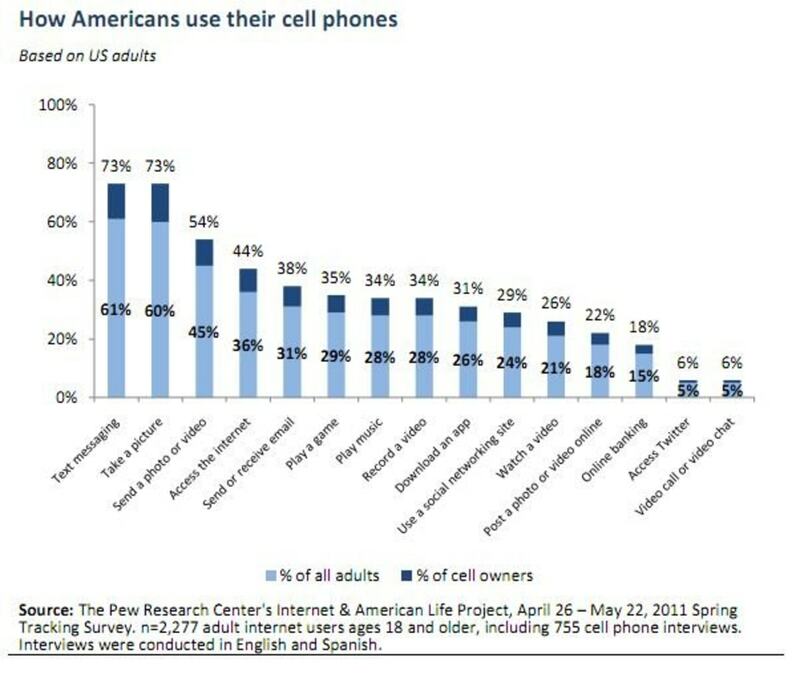 And then there's this use for the phone, which 13 percent admitted to: Pretending to use their phone in order to avoid interacting with the people around them. Not that I've ever done that! Check out Technolog on Facebook, and on Twitter, follow Athima Chansanchai, who is also trying to keep her head above water in the Google+ stream.